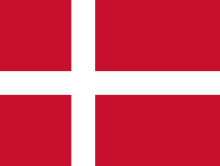 Denmark competed at the 1972 Summer Olympics in Munich, West Germany. 126 competitors, 114 men and 12 women, took part in 74 events in 17 sports. In the first modern archery competition at the Olympics, Denmark entered two men and two women. Their highest placing competitor was Arne Jacobsen, at 8th place in the men's competition. Thirteen cyclists represented Denmark in 1972. Six fencers, five men and one woman, represented Denmark in 1972. Three male pentathletes represented Denmark in 1972. Seven male shooters represented Denmark in 1972. ^ "Denmark at the 1972 Munich Summer Games". sports-reference.com. Retrieved 2011-02-12.